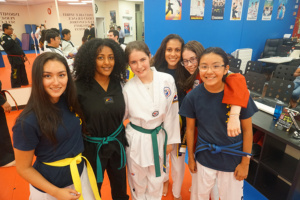 Our instructors will come to your school either during the school day or after school to deliver training that integrates the physical aspects of martial arts with lessons about character development. confidence, respect, and leadership. Below are details on two proven programs we offer to local schools, Be Your Best and Verbal Self Defense. To get more information about our school programs, please contact us. We look forward to working with you on our common goal of making sure the leaders of tomorrow are successful and confident today! 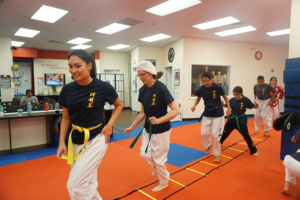 Classes focus on respect, discipline and focus skills. Parents contribute $19 to $39 for the program — the cost is up to you. One hundred percent of the fee is donated to your school. We volunteer our time for the entire program and donate supplies. Kids have daily homework assignments that are discipline and character related. Our Verbal Self Defense program provides children and adults with tools which help resolve conflicts by controlling their responses and using specific word blocks. This same program is used by police officers across the country to de-escalate potentially dangerous situations. Our staff has participated in the same training program slightly adapted to make the messages applicable to children. 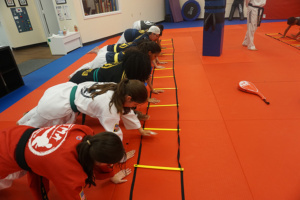 The program is modifiable for all age levels, group sizes and time frames.